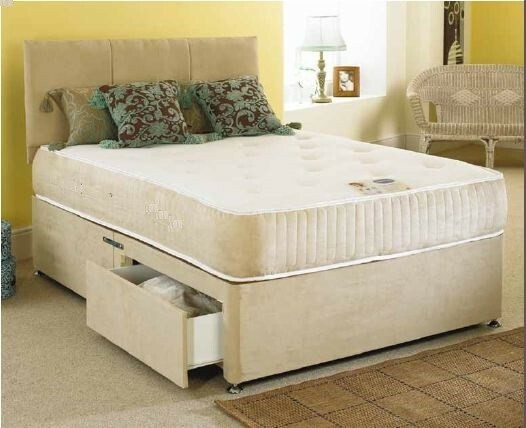 The Monarch 1000 Memory Foam Pocket Sprung 5ft King Size Zip Link Bed comes with luxury mattresses. Each mattress is constructed around 1000 count pocket spring unit with ultra-supportive layers of 5cm high density visco elastic Memory foam to distribute pressure and to provide ultimate comfort and support. Each Spring is sewn into an individual fabric pocket allowing it to move independently and respond to the body's every movement and contour. It provides the best possible support to your spine allowing your body to immediately find the best sleeping position, reducing tossing and turning. Each mattress features turning handles and air vents. The vents allow air to circulate through the mattress and increase freshness and cleanliness. They also prevent excess heat and moisture giving the body a greater relaxed state and increased comfort. They are upholstered with layers of hypoallergenic cotton and polyester fillings. The Monarch is available with a Platform top Base for firmer support or a Sprung Base for a softer more luxurious feel. The divan base is made from solid timber to provide a comfortable, sturdy, sleeping platform.The divan base comes with easy glide castors. Base comes in 2 section with castors and attachments for the headboard.